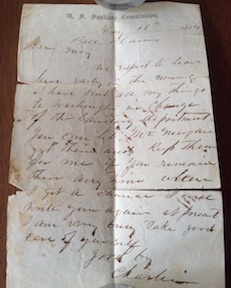 On June 5, 1864, writing from “Camp on the Battle field,” Chaplain H. L. Calder of the 7th New York Heavy Artillery wrote a letter to the wife of Capt. Charles McCulloch, who’d been killed on May 19, 1864 at Harris Farm during the battle of Spotsylvania. McCulloch’s great-great-granddaughter, Joyce Smith, was kind enough to share Calder’s letter with me, as well as a letter written days earlier by McCulloch. With her permission, I share them with you. I have just this moment received your letter and in the midst of the roar of Artiller and Musketry I get a scrap of paper and pencil sit down on the ground to answer as far as I can your request. The night on which your husband was killed we were taken by surprise. Our Reg. with the 1st Maine were resting on their Arms when less than half a mile from us our train of wagons was attacked by the enemy in great force. The two Regiment pushed into the Battle at double quick. Saved the train but at the expense of many precious lives, among them your Dear Husband. I was near the Battle—too near, they say, but I felt agitated for my Regt. all the night after the Battle, I was looking after the dead and wounded. towards day light I found the men who had carried Capts. McCulloch & Morris in to the hospital ground. I got the two Capts. and had them Buried together with head boards, and there names and there regiments well printed thereon. Although it had been arranged by our good Colonel who is now gone that I should go to Fredericksburg with them, But an order was issued for Marching and we had to be up & off & marched 17 hours without refreshments. Great are the fatigues we have to endure times. About his effects: his sword and revolver with 5 dollars and 60 cents were all I saw the money is with me, which I would enclose if safe. the rest was with the company. It was well that I had no more, for in the next skirmish I lost all my own effects. A cannon Ball passed between me and my horse, which was a ball out my Tent Cord. My Man got frightened & ran away with my Horse and left all My things. I have nothing but what is on me, cannot get a change for love of money. In conclusion, you can procure your Husbands remains at some time—they are all marked—But you cannot easily get them Now, so awful are the ravages & victims of this war. Accept with deepest simpathy My condolences and prayers for you in your bereaved State. I Am unwell myself, and I hope you will excuse this imperfect scratch. this is all I can do. The 7th NY Heavies had been deployed to the battlefield only days before the action at Harris Farm. On May 16, Capt. McCulloch wrote home to his wife en route from Washington, where the unit had been deployed in the city’s defense at Ft. Kearny, to join the Army of the Potomac. We expect to leave here early in the morning. I have sent all my things to Washington in charge of the Sanitary department. You can let Mr. Morgan get them and keep them for me if you remain there any time. When I get a chance I will write you again at present I am very busy take good care of yourself. This entry was posted in Common Soldier and tagged 7th New York Heavy Artillery, Battle of Spotsylvania Court House, Belle Plains, Harris Farm. Bookmark the permalink.